The RMS St Helena docked for the final time at ‘E Berth’, Duncan Dock, Cape Town, at 9.51am on Saturday, 17 February 2018, bringing to an end 39 years of dedicated passenger, cargo and mail services to the British South Atlantic Islands and signalling the end of an era of great mail ships, spanning more than 150 years. The vessel departed St Helena on Saturday, 10 February 2018, amid farewell fanfare, but returned to the Island two days later in response to an on board medical emergency. 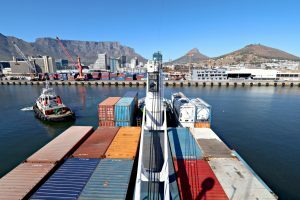 The vessel finally departed on Monday, 12 February 2018, bound for Cape Town. During the voyage, on Sunday 11 February, the final Divine Service was held in the Main Lounge, conducted by Captain Adam Williams. There was a large congregation in attendance and at the end of the service passengers and crew gathered together to celebrate the last ‘Traditional Mail Ship Gin for Jesus’ with the Captain. On the evening of Friday, 16 February 2018, passengers and crew assembled on the Sun Deck at 6pm for complimentary drinks and to bear witness to the Red Ensign being lowered for the very last time aboard a working Royal Mail Ship. After the poem ‘RMS’ by Robin Castell was read by passenger Finley Crawford and to the sounds of Her Majesty’s Royal Marines playing ‘Life on an Open Wave’ across the wooden deck, passengers were presented with their ‘Final Voyage’ Commemorative Certificates by the Ship’s Captain and the Directors of St Helena Line. The Red Ensign was lowered at 6.40pm to the sound of bugles playing ‘Sunset’. The British National Anthem was sung before the ceremony was completed at 6.45pm. Early on the morning of Saturday, 17 February 2018, Table Mountain appeared far on the horizon. 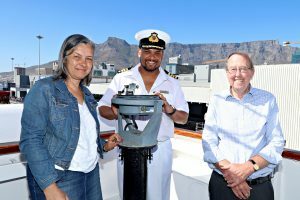 On completion of the mooring operations, the air was thick with sadness as the main engines were stopped from the Bridge by Directors of St Helena Line, Mrs Kedell Worboys MBE and Mr Matt Young, and the Air Whistle cried out one last time before the engines fell silent. 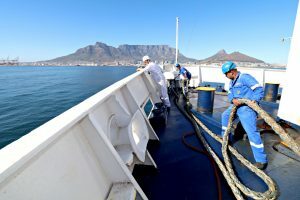 After passengers were disembarked and the alleyways, cabins, lounges and decks emptied, the proud crew began cleaning both passenger areas and their own quarters before one-by-one they left their ship and their sailing family for the last time. 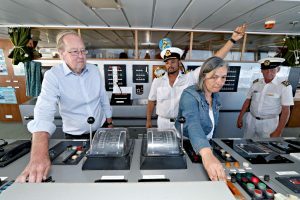 “As the curtain falls on the era of great mail ships, we proudly hand the baton over to a newer and more modern mode of travel and access to St Helena and her people. A period of reflection is needed and we ask that you don’t forget us (past and present) however we encourage you to look to the future and embrace new opportunities.